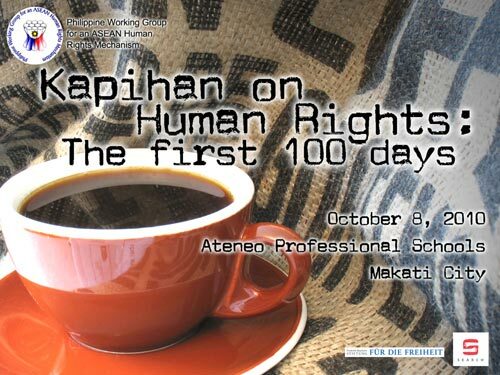 The Philippine Working Group for an ASEAN Human Rights Mechanism (PWG) with the support of the Friedrich Naumann Foundation for Liberty (FNF) organized a forum on 8 October 2010 to assess the attention and priority of the Aquino administration to human rights issues. 120 people who were representatives of non-government organizations and civil society groups attended the event. The forum reviewed the government’s commitment to and compliance with the United Nations Human Rights Council in relation to the Universal Periodic Review (UPR) that the Philippines first submitted in 2008. The participants expressed that the Aquino Administration, notwithstanding the fact that it is in transition and is considerably new, ought to take more initiative in addressing human rights problems in the country. With human rights as a cross-cutting issue, the government needs to give due attention to the creation of a practicable human rights agenda to better fulfill its obligations of promoting and protecting the rights of its people. The participants conducted their own review and analysis of five parts of the UPR report in relation to the: Convention on the Elimination of All Forms of Discrimination Against Women (CEDAW), Convention on the Rights of the Child (CRC), Convention Against Torture (CAT), Convention on the Elimination of Racial Discrimination (CERD), and International Convention on the Protection of the Rights of All Migrant Workers and Members of Their Families (ICMW). In discussing CEDAW, the call for greater security and protection to female migrant workers were made. The Cybercrime Prevention Act was also pushed. The CRC topic focused on prohibiting all forms of violence against children and ensuring effective investigation, prosecution, and compensation on child torture cases. The CAT issue was controversial where the repeal of the Human Security Act, and opposing the amendment to Republic Act 9344 Changing the Age of Crime Responsibility from 15 to 12 were lobbied. Under the CERD, an assessment of the 2010 census on the inclusion of the ethnic variable was proposed to come up with disaggregated data on the socio-economic status of indigenous peoples. With ICMW meanwhile, programs for overseas contract workers and house help were suggested. The forum on October 8 was the first of a two-part activity. Its summary of proceedings will be made available and presented to all relevant government agencies and will provide the baseline information for the discussions at the yearend Kapihan on December 7 in celebration of the Human Rights Week.